But the scheming Walter Burns doesn't want to lose his best reporter and he isn't going to let a little thing like Hildy's divorce, remarriage and retirement from the newspaper game get in his way. The city's newspapers are covering a big story, a mixed up guy, Earl Williams (John Qualen), who lost his job, lost his mind (maybe) and killed a cop. To get Hildy back on the team, Burns emotionally blackmails her into covering the story and writing a sympathetic interview that could help Williams get committed to an institution instead of executed. Meanwhile, he concocts increasingly complex schemes to delay her marriage and keep her fiancé out of the picture. 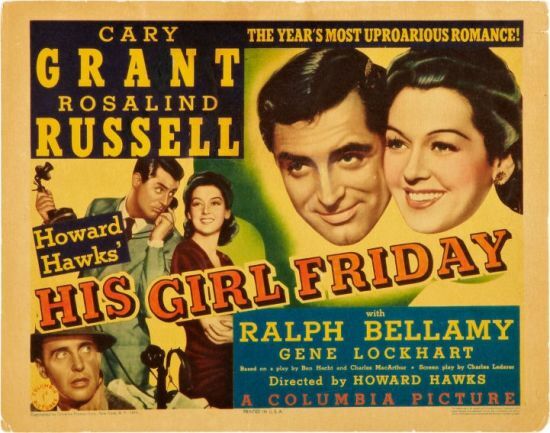 His Girl Friday is a gender-swapping version of the play The Front Page. The play was written by Ben Hecht and Charles MacArthur and first staged in 1928. In the play, Hildy is a man and the relationship between Walter Burns and Hildy is a more straightforward one of a manipulative editor and the star reporter he doesn't want to lose. The play had already been filmed once in 1931, in a film directed by Lewis Milestone, with Adolphe Menjou and Pat O'Brien as Walter Burns and Hildy Johnson. The 1931 film was a well regarded adaptation of the stage play, but His Girl Friday's changing of Hildy from a man to a woman, and her relationship with Walter Burns from one of an employee to that of employee and ex-wife, is a stroke of genius. The fact that Walter Burns is now also Hildy's ex-husband and one who, it seems, is no more accepting of their divorce than he is of her retirement from newspapers, opens up many new possibilities for humour, conflict and drama. But mostly for humour. And it's the newly acquired romantic angle that shifts the story firmly into screwball comedy territory. The film was directed by Howard Hawks and reunited him with Cary Grant, the star of his 1938 comedy Bringing up Baby and 1939 aeroplane drama Only Angels Have Wings. Like Bringing up Baby, His Girl Friday appeared at the height of the screwball comedy cycle in Hollywood in the late 1930s and early 1940s. The screenplay was by Charles Lederer, who had been brought onto the 1931 film of The Front Page to provide additional dialogue, and had uncredited input from Ben Hecht. The script is smart and witty, and the dialogue often razor-sharp. The banter between Hildy and Burns is especially strong in the film's early scenes. These characters create snappy comebacks and witticisms just as they create the news, crafting it and presenting it to be the way they want it to be. Hawks's direction keeps things moving along at a rapid, almost breathless, pace. The quick-fire, and often over-lapping, dialogue reflects the characters' quick-thinking and mirrors the hectic pace of the world of news reporting. The film is famously fast-paced and many of the lines can easily be missed on a first viewing. The screenplay is also full of throwaway lines and in-jokes, some of them allegedly ad-libs by the cast. It's hard for film buffs not to be delighted when Cary Grant describes Ralph Bellamy's character as someone who “looks like that fellow in the movies, you know ... Ralph Bellamy”. Or when Grant (born Archibald Leach) responds to a threat with the line “The last man who said that to me was Archie Leach, just a week before he cut his throat”. The film does move a little from smart satire and witty repartee to something closer to farcical territory in the last third, as Hildy and Burns have Earl Williams hidden inside a bureau in the press room. But the performances manage to maintain their energy to the end, and the film avoids falling into strained farce. A film like this relies on perfect casting of its two leads, and fortunately Hawks struck gold with his two stars, despite Rosalind Russell being a long way down his list of possible actresses to play Hildy. Carole Lombard seems to have been the first choice, but was too expensive. Various sources suggest Irene Dunne, Ginger Rogers, Katharine Hepburn, Claudette Colbert, Jean Arthur and Margaret Sullavan all turned the part down. The casting is crucial, because the relationship between Hildy and Burns is at the heart of the film. While they may be divorced, it's obvious that this is a situation that Burns regards as only a temporary state of affairs. He knows that if he can get Hildy back in the newsroom, where he thinks she belongs, and back working with him, then she will see the obvious folly of marrying Baldwin and settling down to a life of domesticity. This is obvious to the audience too, just as it's obvious that Hildy and Burns belong together, personally as well as professionally. Walter Burns, of course, is a bit of a jerk, and he's especially cruel to poor Bruce Baldwin, and his mother when she arrives. Burns lies, cheats and manipulates everyone around him into doing what he wants and into serving his own ends, and he even has Baldwin thrown into jail to get him out of the way. But Cary Grant is so damn charming and likeable that it's hard to hold it against him, and he makes sure that the audience is always in on the joke, and therefore on his side, in whatever he does. 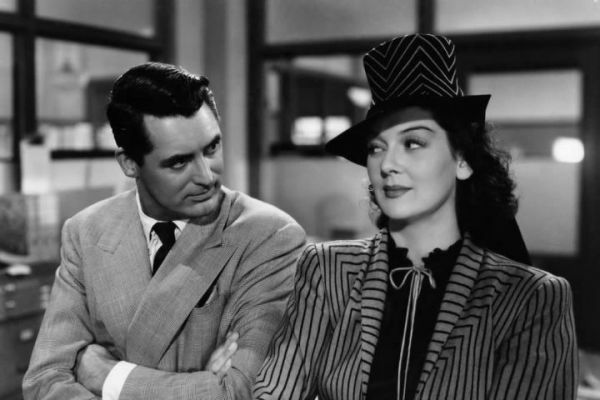 His Girl Friday's working title was The Bigger They Are, but “Nothing Sacred” might have been more appropriate, if it hadn't already been recently used, because, underneath all the banter and wisecracking, it's an incredibly cynical film. While it portrays newspaper journalism as exciting and fast-moving, it also makes it clear that editors and reporters are ruthless, cynical and amoral. They twist stories to suit their own agendas, put words in the mouths of interviewees and are not exactly reliable in their reporting, with a roomful of reporters all shown giving different accounts of the same event to their respective newspapers. An ironic opening title card tells us that this all happened in the “dark ages” of newspaper reporting and obviously none of this could happen today, a line it's pretty obvious we're meant to take as tongue-in-cheek. His Girl Friday at least doesn't discriminate in its mockery. City hall and local politicians are corrupt, public officials can be easily bribed and the crusading reporters are twisting the facts to save a man who is obviously a murderer, and not a victim of a miscarriage of justice. The film is surprisingly excoriating as an expose of the morality and characteristics of the press, and of official and political corruption. But its fast pace means that none of this is ever dwelt on and the light-hearted tone sugars the pill to make it more palatable than it really should be. And it's not just journalism and politics that get this treatment; marriage isn't treated very seriously either, but then neither is divorce. As Burns says “Divorce doesn't mean anything these days”. There's also a certain amount of cynicism about Earl Williams, the killer who's about to be executed. The easy option would be to make him a victim of a miscarriage of justice, of rogue or prejudiced cops. Instead, the film is quite clear about his guilt and the fact that he has murdered a policeman. The characters also suggest that the death penalty is inevitable because the policeman who was killed was black and that “The coloured vote is very important in this town”. The film maintains a degree of ambiguity about the killer to the end, offering him an excuse in mitigation, but only a very weak one, and it's not clear just how mentally disturbed he really is. The changing of Hildy into a woman complicates her position in the film's narrative, presenting her in multiple roles, as ex-wife, future wife, star employee and prospective home maker. In the process, Hildy is turned into an archetypal “Hawksian woman”, a woman who can mix it with the men and be one of the male group (in this case a group of cynical, hard-bitten newspaper reporters) but one who does so without losing her femininity. The obvious flaw in the plot, of course, is that there's just no way that Hildy would seriously be intending to marry Bruce Baldwin, the two clearly have nothing in common. Maybe we could take it as a cry for help if she introduced Baldwin to Burns and said they were going to get married in a few months, but not if she is getting married tomorrow, that's just too implausible. 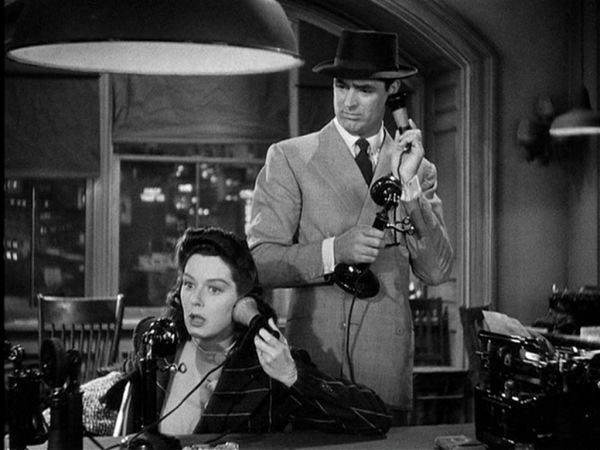 Hildy's supposed dilemma is illustrated in a scene in which she conducts two frantic telephone conversations at the same time, one to Burns and one to Baldwin. But the audience always knows that there's no real dilemma at all. Hildy and Burns obviously belong together just as Hildy's real skill is in being a cut-throat reporter, rather than housewife to an Albany insurance salesman. The competing draws for women of home and the family versus a career and the office was a recurring theme in films of this era. In presenting the workplace as the “natural” place for Hildy, and the life of a housewife as likely to be dull and unfulfilling, the film is a little modernist and subversive for 1940. So the plot is a stacked deck, but it doesn't matter much, because the enjoyment in the film is not derived from the story but from the dialogue and the interplay between the characters. Fortunately, both Grant and Russell are up to the challenge of Lederer's script and the two stars have excellent chemistry, sparking off each other very nicely. Both also possess an apparent desire to keep up with each other and to outdo one another in the banter and wisecracking stakes. While Hildy clearly doesn't belong with Bruce Baldwin, it's debatable just how much of a happy ending the film has. In a way, it's the only ending the film can have, the only logical solution, Hildy and Burns seem to belong together. But Burns has shown no inclination to change and no sign that he will ever put Hildy before his work or show much attention to her needs. The ending, and the film's title, suggest that, however much she is a modern, professional, notionally independent woman, Hildy will always be Burns's “Girl Friday” and, in the final scene, literally a bag carrier. She looks set to be both his wife (again) and his employee for the foreseeable future. Also notable in a much less showy role is Ralph Bellamy, as Hildy's dull and decent fiancé Bruce Baldwin. The film helped to confirm Bellamy's typecasting as dull, dependable, but not unlikeable characters. He had even played this type of role opposite Cary Grant already in 1937's The Awful Truth. It was a couple of years after His Girl Friday that Bellamy saw a note describing a dull and naïve character as a “typical Ralph Bellamy part”, something that motivated him to head off back to the stage to play a range of more demanding roles and to escape his typecasting. 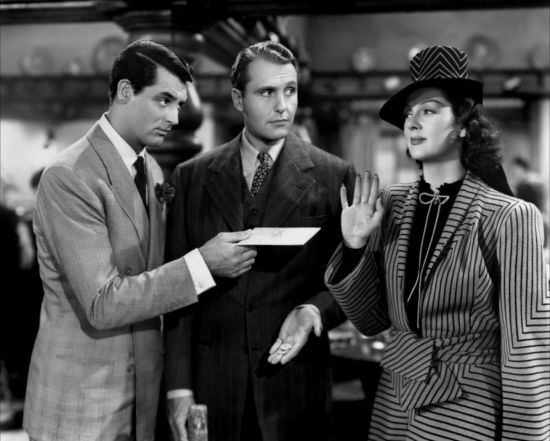 His Girl Friday is more than just a classic screwball comedy. It's perhaps the quintessential film about newspaper reporters in the pre-digital age. We've all absorbed that mythos of bustling newsrooms, hard-bitten journos, clacking typewriters, hyperactive editors and people shouting down telephones. 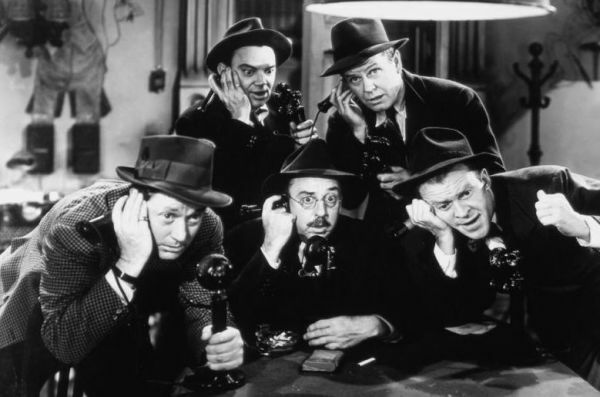 Did this world ever really exist, or was it created by His Girl Friday and its predecessor, The Front Page? His Girl Friday built on Rosalind Russell's success in The Women (1939) and helped to establish her screen persona for the next decade. It also confirmed Grant's status as a top star of screwball and romantic comedies. The film was the third of five that Grant made with Hawks, following Bringing Up Baby and Only Angels Have Wings. The two men would work together again on the comedies I Was a Male War Bride (1949) and Monkey Business (1952). Hawks would also make another four films with the film's screenwriter Charles Lederer; I Was a Male War Bride (1949), The Thing from Another World (1951), Monkey Business (1952) and Gentlemen Prefer Blondes (1953). The Front Page was remade a couple of times for television, and Billy Wilder remade it as a feature film in 1974, with Walter Matthau and Jack Lemmon as Burns and Hildy. The 1988 film Switching Channels, with Burt Reynolds and Kathleen Turner, updated the story to the world of TV news. His Girl Friday is still a fast paced and funny film. It's one of Howard Hawks's best films and one of the sharpest comedies of its time. It's easy to see why the source play, The Front Page, has been remade so often, the play and its premise are so sturdy and foolproof. The problem for every other version, though, is that the twist put on it by His Girl Friday is so brilliant, and the execution of it so perfect, that it's hard to see how it can be bettered. Very nice and detailed review of a great movie. I just love it. You're right, there is so much going on in this film but we don't really think about it because of the breakneck speed. Come to think about it, it's more than a bit iffy that both are so willing to help a murderer. However, the only thing the audience focuses on is seeing two absolute pros at work, and it's a joy. It's surprising some of the stuff they got away with, but the fact that it moves so fast definitely helps. Howard Hawks and I don't always get along, but I think this one is a solid gold classic. What don't you like about Hawks? I must say I'm a fan. I suppose humour is an individual thing, but I find some of his comedies tip over from "fast and furious" into "strained and desperate". And many of his later films are a bit pedestrian and self indulgent. To me its a mixed picture, although there are some famous ones I haven't seen. I understand. I feel the same about Capra. I don't dislike him, that's pretty hard, but he's a bit too folksy for me and the social commentary in his films can occasionally come off as preachy or simply fall flat. Yeah, I can relate to that as well. There are still quite a few famous Hawks films I should see, The Big Sleep, To Have and Have Not and Sgt York, so I might become more forgiving of the ones I don't like. Cracking film. The dialogue and scenes between Cary Grant and Rosalind Russell are first rate. Great write up. Yes, they have great chemistry. The script is so strong it's hard to believe so many actresses turned it down.